Surf conditions haven't improved today in Biarritz forcing the organizers of the ROXY PRO to call competition off for the second day in a row. An anticyclonic system sitting right in front of the European Atlantic coastline is blocking all chances of a swell making its way to the beautiful city of Biarritz and waves of only 0.5Ft are breaking at Côte des Basques today. "There'll be another call tomorrow morning at 11am," ASP Women's Tour Manager, Jessi Miley-Dyer stated. "If conditions are still like this we're looking at doing an international tag team with the girls, which should be really fun with this incredible weather for them and also for the public of Côte des Basques." 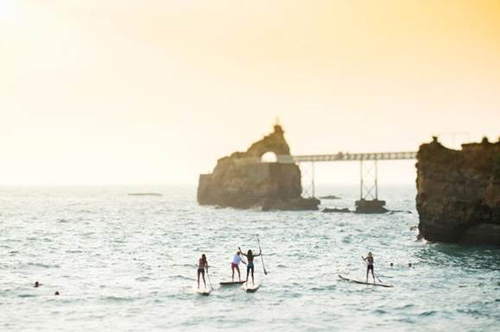 Despite no competition being run at the iconic birthplace of European surfing so far, Roxy made everyone's day at the beach entertaining with fitness classes, stand-up paddle introduction lessons and other fun activities at the event's beachside village.